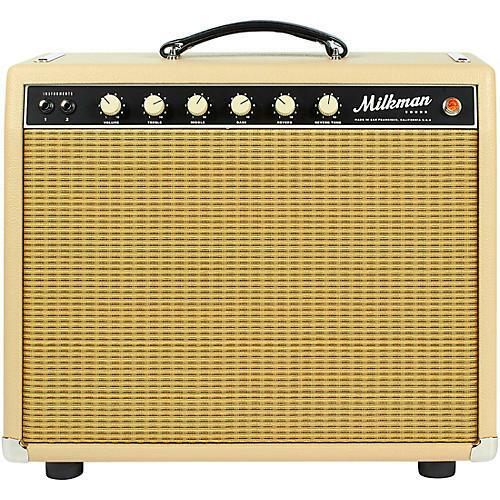 The Milkman 40W Pedal Steel Mini Combo is a compact, lightweight version of the Milkman 85W Pedal Steel Amplifier. Boasting 40W, the amp has half the power—nearly half the weight—but the same full tone as its big brother. This means you can crank the amp up to the sweet spot without tearing the paint off the walls, and easily bring the amp to the gig without tearing the muscles in your arm. The chassis is hand wired onto a turret board using Jupiter capacitors and Mercury Magnetics transformers. The tube reverb section is deep and powerful with the additional tone control, and whether you are playing the amp clean or broken up, the sound is 3 dimensional. You won't believe how big this amp thinks it is!